Manxgirl living and crafting down under. 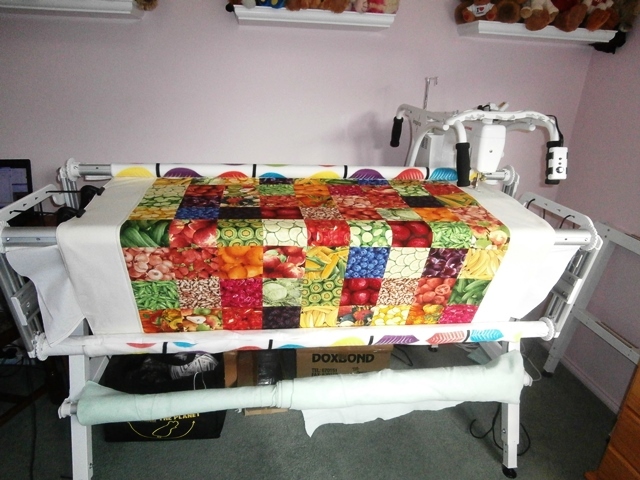 : I was quilting!! I had more than needle issues here today. It was the final straw! Down tools, go do something else. Only two layers for this one. The pieced top and the lovely bright fleecy back I showed in my last post. Hence nothing coming up from the batting roller on this image. ...is that the vegetable quilt I see??? and I'm having tension problems, so we're not doing very well between us are we? Back to the crafty stuff.